Published: Sept. 29, 2016 at 07:46 p.m. Updated: Sept. 29, 2016 at 08:33 p.m. Here we'll look where cornerbacks and wide receivers line up, which defenses are particularly susceptible to which player packages and so much more in order to find value with our fantasy players. As the season goes along we'll have even more data to use and a better understanding of the Next Gen Stats. Here are the top matchups that could bring value in Week 4. Much of the discussions in NFL circles this week has centered around the fast development of No. 2 overall pick Carson Wentz. To his credit, Wentz has been fantastic, throwing for 769 yards and five touchdowns without an interception in 102 pass attempts. He's earned the praise he's received for executing and playing well during the Eagle's 3-0 start to the season. However, another rookie quarterback deserves just as much credit for the job he's done in unexpectedly taking over a starting job. Dak Prescott also has yet to throw an interception on his 99 pass attempts. He's also chipped in 54 yards and two scores on the ground. Much like his counterpart Carson Wentz, Prescott has made a living off efficiently attacking certain areas of the field. 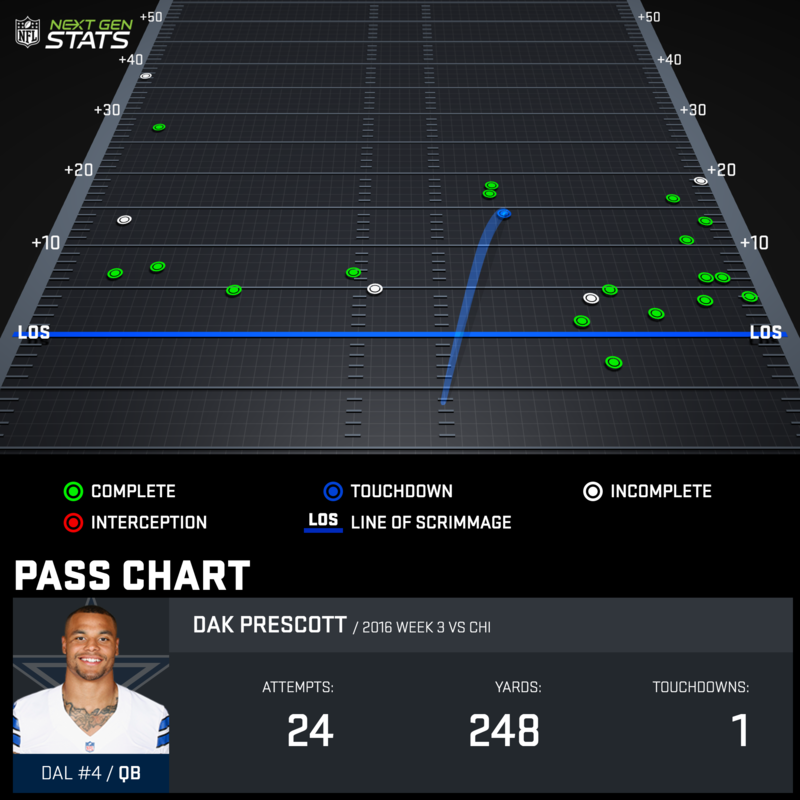 As Prescott's passing chart illuminates, he only attempted six of his 24 passes 15 yards or more down the field. Additionally, 16 of his attempts went to the right side of the field. In a bit of a contrast to Wentz, however, Prescott ranks in the middle of the NFL (15th) in average air yards on his passes with 9.43. Carson Wentz ranks 23rd with an 8.48 average. None of this is meant to denigrate Wentz's strong play so far, but rather to lift up Prescott as a rookie who is also way exceeding anyone's expectations. Prescott also has some unlocked upside as a runner. Anyone familiar with his game knows he's a threat with the ball in his hands as a runner. Yet, his top max speed on the season (17.92 MPH) ranks just 38th in the NFL among quarterbacks and it came on an 11-yard run in Week 1 to the Giants. Week 4 looks like a strong matchup for Prescott to turn some more of his solid play into a big stat line. Going back to last year, the 49ers pass defense plays much better at home than on the road, as evidenced by their Week 1 dismantling of the Rams. Trusting rookie quarterbacks on the road is a bit dicey but Prescott could buck that trend. It looks like San Francisco will be without the assistance of their top cover corner in slot defender Jimmie Ward. The former first-round pick went down with a quad injury in the first half of the Week 3 loss in Seattle. Seahawks slot receiver Doug Baldwin amassed 101 of his 164 yards when he lined up in the slot. 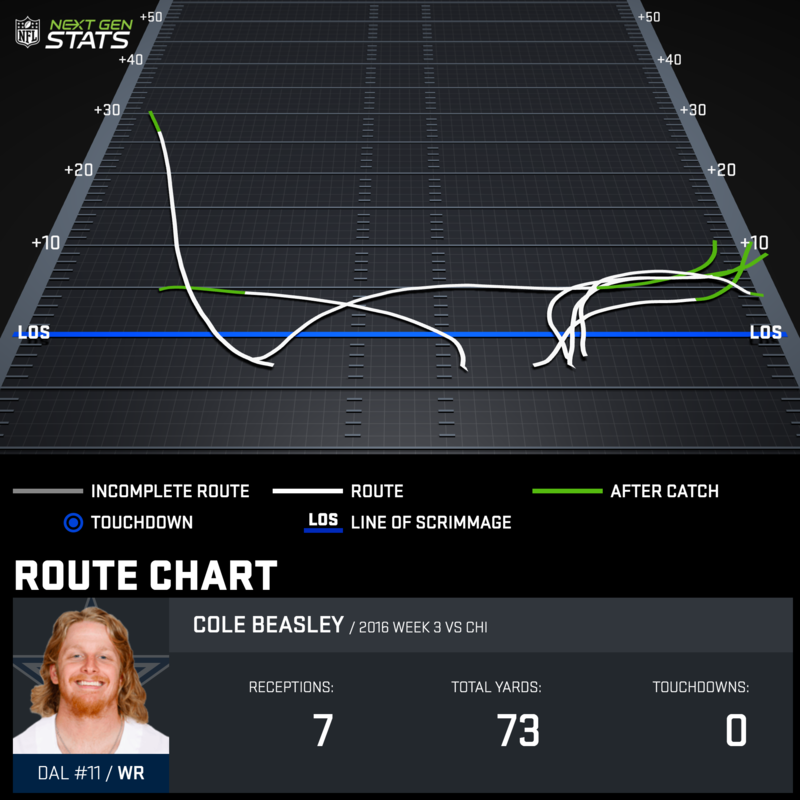 While Dez Bryant's availability is in question and that makes quite a difference, Dallas' highest targeted receiver is actually slot receiver Cole Beasley. He's lined up in the slot for 89 percent of his snaps and accumulated 90 percent of his yards from the inside. Beasley will square off against this newly opened weakness in the 49ers defense. Beasley's usage primarily comes on these quick outs to the flat and slants. He's been a reliable target in the early going for Dak Prescott. He'll have a chance to flash open on these short routes with ease and perhaps haul in some downfield passes against the 49ers depth corners. Particularly if Dez Bryant sits, Beasley has a chance to clear 10 targets and enjoy his best game of the season. The Lions' new early-down back, Dwayne Washington, has all the makings of potential sneaky league winner. He already has a red-zone and goal-line role in a top offense locked down and with Ameer Abdullah on IR he has a chance to usurp the vast majority of the rushing work. His only competition is Theo Riddick, who has a career yards per carry average of just 3.0. Washington is also highly athletic, running a 4.44 40-yard dash and posting a 37-inch vertical at 220 pounds at the NFL Scouting Combine. He hasn't had a big chance to show that athletic ability in his rushing output yet, but he has displayed the speed on other plays. Washington cleared 21 MPH in all three games this season when playing special teams. His highest speed with the ball as a runner in Week 3 was 18.23 on run off the right tackle. Week 4 should bring a chance for Washington to show off his ability more. Washington wasn't able to run downhill against a stout Packers run defense that allows just 2.0 yards per carry. Washington averaged 5.5 yards of distance per rush yards gain. For context, power back Jeremy Hill bruised the Broncos on downhill runs and averaged 3.0 yards of distance run per rush yard gained. The Bears will be unable to stop Dwayne Washington if the Lions get an early lead and feed him a strong volume of touches. Ezekiel Elliott saw the most carries (15) when facing eight men in the box among running backs in Week 3 against the Bears and still averaged 4.9 yards per carry on those plays. If you haven't yet, try and make a move to acquire Dwayne Washington. This might be your last chance to do so before his potential becomes apparent to the rest of the world. The Chiefs defense isn't what it used to be, and that means their offense must change as well. Despite the defense's 2-to-8 touchdown-to-interception ratio, they've only sacked opposing quarterbacks three times in as many games. The Steelers should get back on track offensively when Kansas City travels to Pittsburgh on Sunday night, especially since Antonio Brown will likely run the vast majority of his routes away from playmaking corner Marcus Peters. In Week 1 a similar game script unfolded and Alex Smith responded with a big game. He threw 48 passes, which is far more than we usually expect from him. Smith attempted just nine passes beyond 15 yards down the field and actually averaged less air distance (19.31 yards) and air yards (7.21) on his passes than he has on the season thus far (20.76 and 8.11). It's all about the volume increasing, not necessarily taking more shots down field, for Smith to access his weekly ceiling. Smith's getting the ball out so quickly will also be effective against Pittsburgh's defense, who already struggles to get to the quarterback. Pittsburgh has just one sack on the season, which took 6.8 seconds to occur, ranking 210th in the NFL in terms of the fastest sacks. If forced to give chase to the Steelers, Smith could turn in yet another great week as a streaming quarterback. Plenty of people will sweat Mike Evans' matchup with the Broncos secondary. However, considering Evans owns a 30 percent target share on an offense that leads the NFL in pass attempts, we have reason for hoping he can overcome. 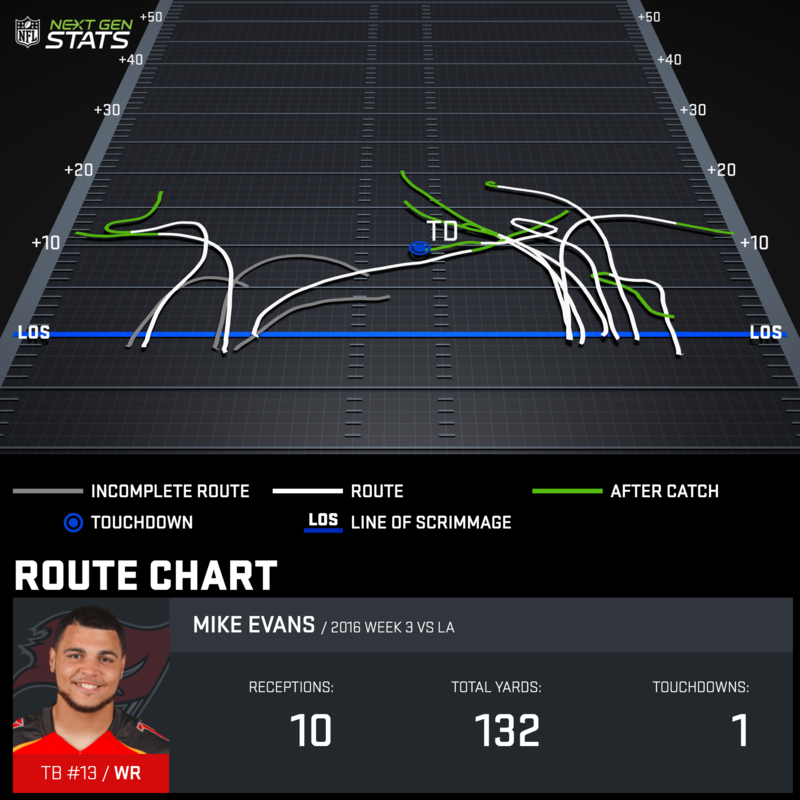 Despite the matchup looking a bit frightening on paper, don't even consider benching Mike Evans. He's taken the third-year leap and is a strong bet to crush every single week. Jimmy Graham got back on track in Week 3. His snap share rose the previous two games with 21 percent in Week 1 and 82 percent in Week 2, before culminating in a 68 percent share in a blowout win over the 49ers in Week 3. Graham's health is incredible to see after a devastating injury, and we should expect him to remain a big part of this offense. While we should not be so quick to forget how Seattle struggled to incorporate him into the game plan on a consistent basis last year, there's reason to think that this year will be different. Graham lined up in slot on 27 of his passing plays and racked up four of his catches for 85 yards. He accumulated just 23 percent of yards from the slot in 2015 when the Seahawks tried without success to make him a traditional tight end. If the team is finally figuring out how to best use Graham and he's also fully healthy, he can absolutely re-establish himself as top-five tight end. Graham has a chance to begin that trek this week against the Jets. Travis Kelce put up six catches for 89 yards and a touchdown against them in Week 3. Kelce accumulated all of his production when split away from the tight end spot, with 70 percent of his yardage coming out wide and 30 percent coming in the slot. 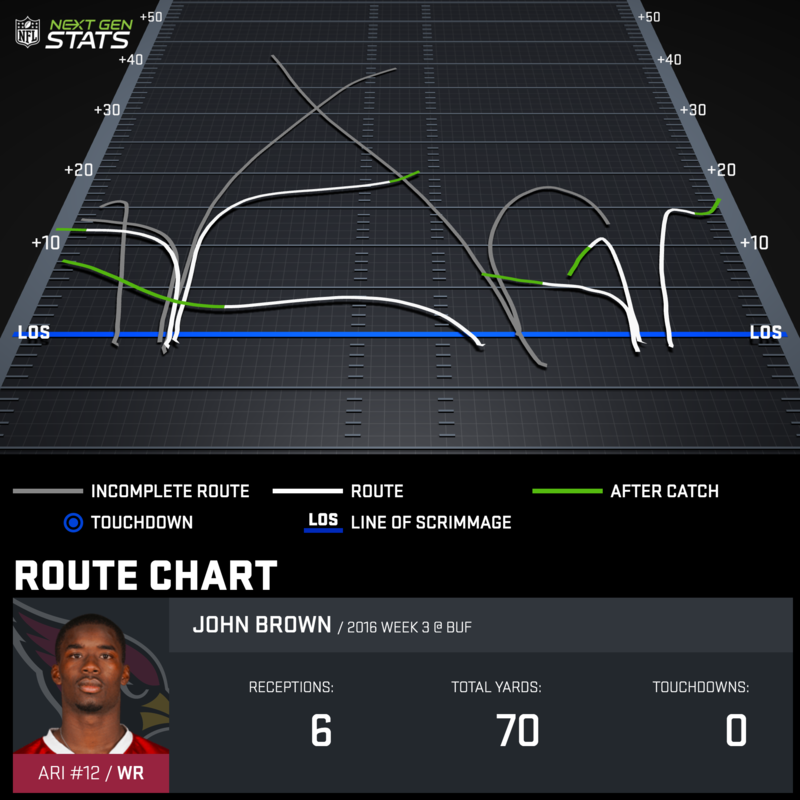 John Brown finished second on the Cardinals in targets (11) in Week 3 and led the team in receiving yards (70). While he only played 57 percent of the team snaps, it was clear they wanted to get him more involved. Michael Floyd is not only in the concussion protocol, but his 39 percent catch rate is dead last among starting NFL receivers. The team needs an upgrade, and Brown could be it. Carson Palmer leads the NFL in average air yards on his passes with 12.01. He was clearly pressing and couldn't connect on those deep passes, so speedy Brown (22.48 MPH max speed in 2015) can help there. Yet, what the offense really needs is another wide receiver threat to help in the intermediate game along with Larry Fitzgerald just to keep the offense moving. While Brown gets stereotyped as a deep threat, he reminded us on Sunday that he is a complete receiver and a skilled route-runner. You can see in his route chart that Brown ran a full complement of routes, including the curl, slant, out and post. His chart also features some of the cleaner patterns we've seen in these charts, illustrating how precise of a route-runner he really is. Brown was on a clear career ascension over the first two years of his career before concussion issues caused him to miss "way too much time" this offseason according to his head coach Bruce Arians. As long as his usage stays strong and his snap count goes up, Brown has a clear chance to reestablish himself as solid contributor in Week 4. Brown took 44 percent of his snaps from the slot in Week 3 and the Rams just gave up 61 yards to Adam Humphries out of the slot in their last game. Brown can certainly take advantage of the Rams corners, and he also split his time between left (30 percent) and right (16 percent) in Week 3, showing he can play all over the formation.